Story Maps for improved community awareness – WaterCONNECT. To improve community awareness and public participation, water managers want to share relevant data with their stakeholders and with the general public. Thanks to the ESRI ArcGIS connection, selected data from Delft-FEWS can easily be shared via interactive ESRI story maps. 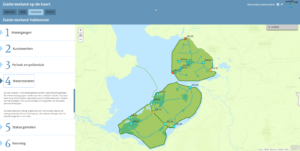 The Story Map developed by Waterboard Zuiderzeeland gives the community an improved understanding of the current and forecasted situation of the water system.